I apologize in advance that I might make mistakes when it comes to the terminology used in the professional dancing world. There were plenty of new terminology that I've heard of before but not really familiar with being thrown left and right in this episode. So I till take me a few episodes to really get a good grasp of the terminology and how these dance tournaments work. So this episode we're at the 37th Prince Mikasa Cup The World Champion Qualification Tournament that Hyoudo was talking about at the end of last episode he was planning to take part in to I assume to quality in some world championship? So we see Sengoku taking the Tatara and the rest of the studio crew going to this cup to watch Hyoudo and Shizuku partaking in. To the rest of the competitors they feel like it's set in stone that these two are going to take the top spot. 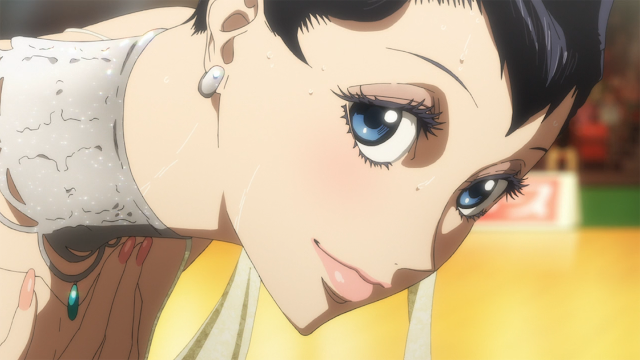 The first dance in the episode was latin dancing, where we see Hyoudo and Shizuku effortlessly dominate the dance floor with their routine compared to their competition. It's after this dance we see Tatara going into the bathroom to practice some dance moves after being spelled from seeing Hyoudo and Shizuku's performance. It's the same scene where some spectators, overheard by Tatara and Hyoudo, trashing Hyoudo's talents; as well as Tatara finding out that Hyoudo has been using athletic tape to bog down his injuries. Felt sympathetic towards Hyoudo during this scene. It must be hard working your way to the top, having parents who are also known pros, causing people to assume that because of your lineage, people think that you've gotten to where you were because of your family. Instead of people thinking that Hyoudo got to where he's at now because he's climbed those stepping stones on his own. It was not obvious to me that Hyoudo wasn't going to complete in the next round due to his injuries, since he hid them so well. On top of that, much to my surprise Sengoku got Tatara all done up, and put him as Shizuku's partner in the next round since Hyoudo was injured. 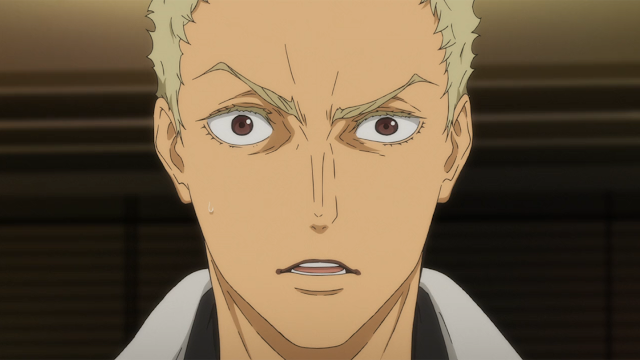 This part of the episode was the highlight, I loved the element of surprise that Tatara was substituted, and although the performance was not great, there were aspects to their routine that had everyone in shock, a good shock. Last post I mentioned how I thought Tatara was a natural talent, and could learn dance by simply watching others, with a bit of practice. 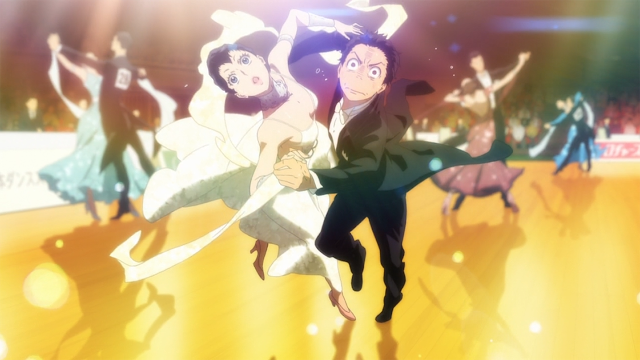 Seems like that theory had some validity to it as we saw Tatara nail the Hyoudo and Shizuku's choreography without practice with another dance partner. I loved watching this part of the anime, it really shows how much room Tatara can grow. 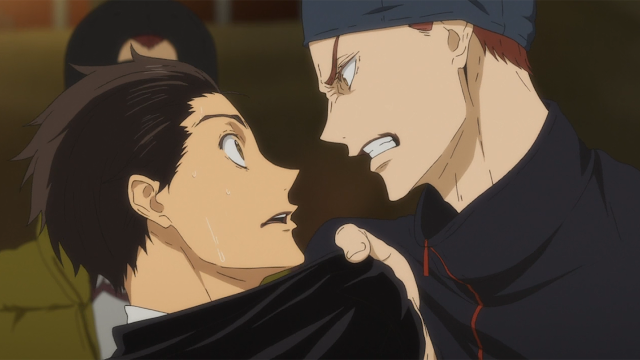 Episode ended with a cliffhanger where Hyoudo was angry with Tatara. My guess is that he's mad that someone took his athletic tape. But we'll see why he's mad in episode four. Also, the long necks were very much appoint in this episode. Anyways hoped you enjoyed my recap of this episode!